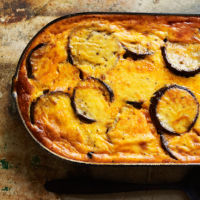 Moussaka is probably the most famous of all Greek dishes. My simplified version has a yoghurt-based topping instead of the traditional white sauce, making it perfect for a quick, mid-week supper. It’s also a fantastic example of a dish that uses only one spice, cinnamon, which really comes into its own when used in savoury dishes. 2 Heat 2 tablespoons of the oil in a large pan and fry the onion over a medium heat until soft and starting to colour. Add the garlic and cook for another 2 minutes. 3 Add the mince to the pan and cook for 10–12minutes until nicely browned. Add the tomatoes, tomato purée cinnamon, oregano and stock and cook, partially covered, for about 1 hour, stirring every 10 minutes or so to prevent it sticking. 4 While the meat is cooking, heat the remaining olive oil in a pan and fry the aubergine slices over a medium heat for 4–5 minutes, until golden but not crisp. Drain on kitchen paper, season with salt and pepper and set aside. 5 To assemble, spoon one-third of the lamb mixture into the bottom of an ovenproof dish and top with a layer of aubergine slices. Add another layer of meat, then a layer of aubergine and repeat until all the meat and aubergine slices have been used up. 6 Whisk together the ingredients for the topping and pour this mixture over the top. Cook in the oven for 30–40 minutes, until the top is golden.